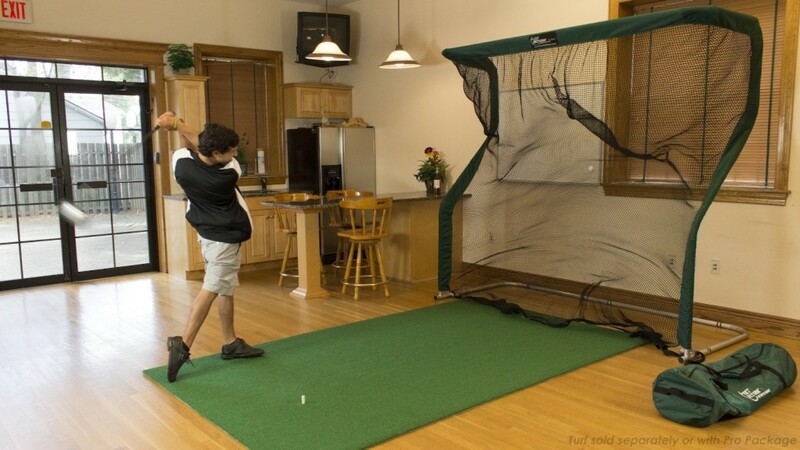 Home › Training equipment › What is the Best Golf Practice Net? As much as you love to golf, let’s face it… you never get to play enough, let alone go to the practice range as often as you need to. You can only improve your game with practice, practice and more practice. But, with work and family commitments, it’s not always easy to get to the range as often as you want. A golf net may just be the solution for you. It will allow you to practice at home whenever you have time to spare; even if it’s only for 10 minutes or while you’re watching the game dying to hit the ball. You want to get bang for your buck, so you’ll want the best golf practice net that suits your budget. Let’s see if we can help you with that. The size of the net is probably the first thing you want to look at. You may want to set it up in your garage, basement, backyard or even the driveway. You may even want to move it around depending on the weather. The netting is another key factor. You’ll be hitting real golf balls so you want a quality, durable and strong net that won’t rip, sag or fold in on itself. A very handy feature in some of the best golf practice nets is automatic ball return. The net will allow the ball to roll back to you so no running around after it. Take a very close look at the frame construction and material. You want to specifically consider if it will hold it’s shape over time, is it easy and quick to set up and does it have ground anchors should you decide to use it outdoors. The best golf practice net should allow you to practice with all of the clubs in your bag so check on the range of clubs the net is suitable for. 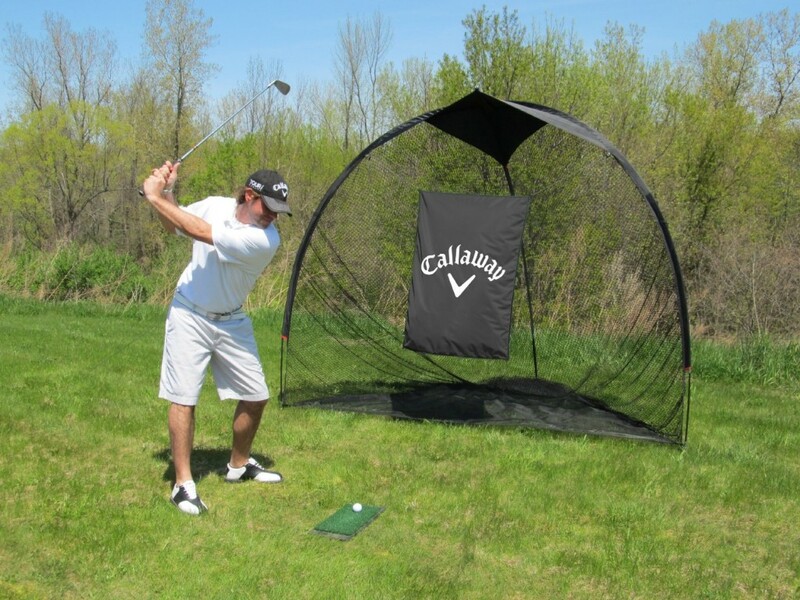 The Callaway Tri-Ball Hitting Net net comes in three sizes: 6 x 7 Feet, 7 x 8 Feet and 9 x 10 Feet. It is reasonably priced at $68.99, $89.98 and $128.21 respectively (on Amazon). The net is made with an extremly strong netting (self-proclaimed “strongest netting in golf”) and includes a hanging target to help improve your consistency. The unique triangular shape of the net allows you to practice with a full range of clubs — from your driver through to your wedge. This net is freestanding, so you can use it indoors, and includes stakes to anchor it outdoors. It also packs away in a nylon carry bag so you can easily take it wherever you want or simply store it away. The smallest of the three sizes (6’x7′) is most ideal for indoor use. There are some downsides to this product. Some players have experienced net breakages or polls snapping after limited use. Callaway is a reputable brand, and stands behind its product. So, if the netting unexpectedly breaks, or pole snaps, just contact Callaway and they will send you a replacement part. The biggest problem with this golf net though is that it can be a bit difficult/complicated to set up (Callaway’s Tri-Ball Hitting Net instructions). You may need a friend or two to help you figure it out the first couple times. If you are looking for an affordable option from a reputable brand, then the Tri-Ball is one of the best value golf nets available on the market. This high quality golfing net from Rukket is available in one size only (10 Feet wide, 7 Feet high and 5 Feet deep). It can be used outdoors or indoors, but the size probably makes it impractical for indoor use for most people. It costs $199.99, and hosts a variety of features to back up its price. 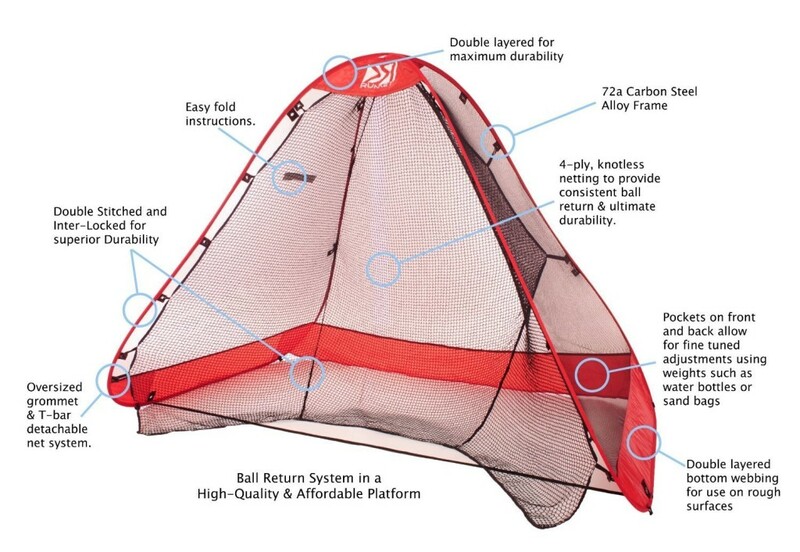 It has a unique double net system to ensure that your ball will never rip through. The frame is made from strong steel, instead of fiberglass like most other golf nets. The rest of the Rukknet is double stitched and uses heavy/durable materials. The four-ply knotless netting design disperses power from your shot easily and returns the ball to you. You can easily hit a full powered driver into the RukkNet, and not worry about anything breaking, ripping or your ball flying back at your face. Maybe the best part about the Rukknet, is that it is incredibly easy to set up. It literally pops open when you want to use it, similar to some camping tents. Coincidentally, the one downside of the RukkNet is that it can be a pain to fold back up. If you aren’t careful, the bars will get twisted. Of course, after a few times, you should get the hang of it. The RukkNet is also not very good to use on windy days, as it will get pushed/blown over easily due to its light weight. If you don’t mind spending $145, then we can recommend the RukkNet as one the best golf practice nets available. 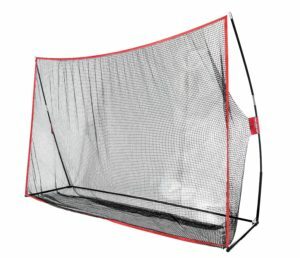 The PowerNet Golf Practice Net is 10 feet x 7 feet x 3 feet and retails at a very reasonable $99. The construction of this golf net is absolutely fantastic. The metal frame is very sturdy, and extremely well made. You do not need to worry about the net tipping over. Most customers report that they do not even use the included ground pegs to keep the net in place. The netting itself is heavy-duty, and made of 6 ply knotless construction, so you do not need to worry about it ripping even if you are blasting your driver shots into it. The netting is also designed to return the ball back to your feet after each shot. One of the best features of the PowerNet is that it is incredibly easy to set up. You can literally set it up or take it down in about 2 minutes (the first time might take a bit longer of course). This makes it optimal for moving into and out of your garage/house depending on weather. Even better, everything is backed by a lifetime warranty! If a part breaks, or goes missing, just call their customer service, and you will get a replacement. For a price of just $99, the PowerNet Golf Practice Net is awesome value. 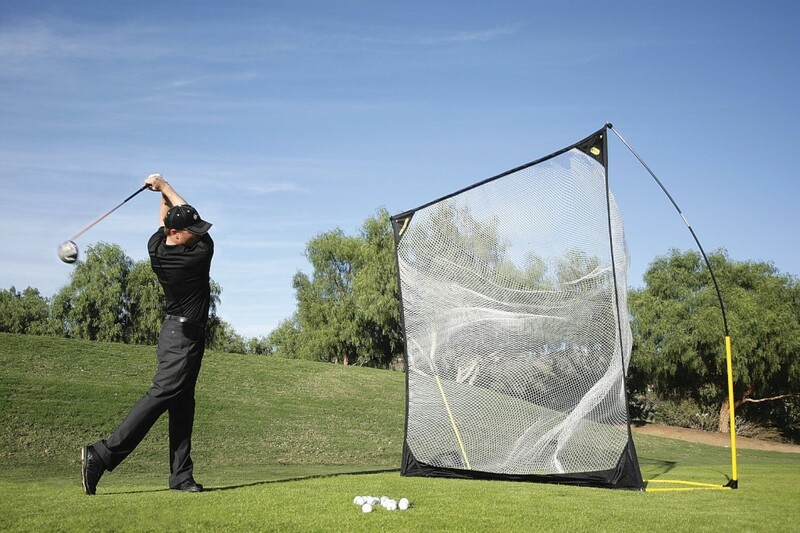 If you want the most bang for your buck, then this is the best golf practice net for you!. With a price tag of $595.00 The Net Return Pro Series Golf & Multi-Sport Net is by far the most expensive net on our list. It is also easily the best all around and highest quality net available. If price is not an issue, then The Net Return Pro Series Golf Net is simply the best golf practice net available on the market today. It can also be used for multiple other sports, such as soccer, baseball, softball, football and lacrosse. The company provides a complete 1 year, 100% money back guarantee when you purchase this net. Please note it does not come with the hitting mat / turf as seen in the picture. You will need to buy it separately (see here for one option). Need a more budget friendly option? 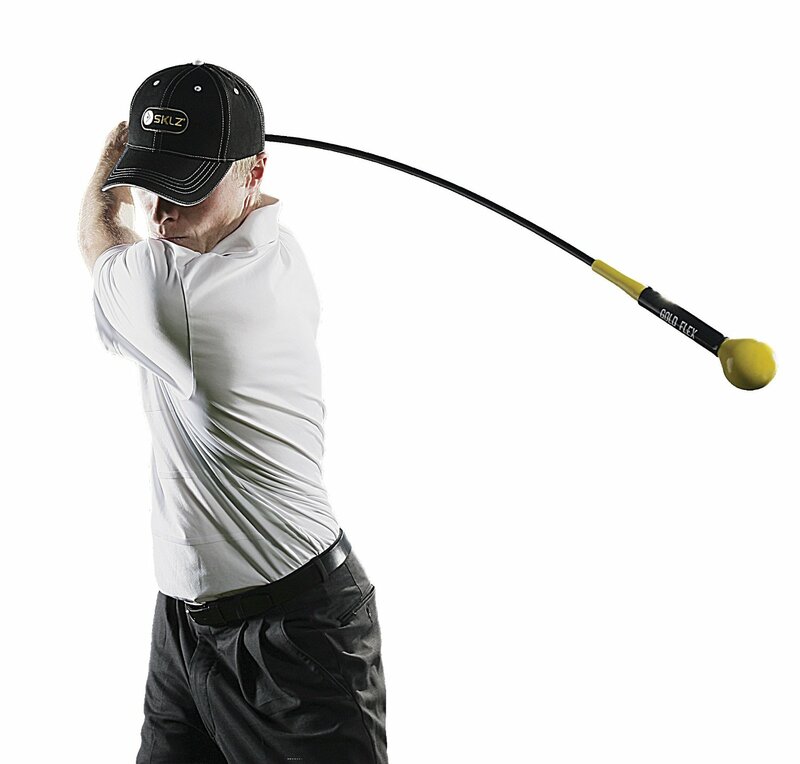 Then the Quickster Golf Net from training equipment specialists SKLZ could be for you. It is available in a couple different net sizes (6’x6′ or 8’x8′), and comes with a removable target for chipping/aiming practice. The frame is constructed from lightweight, but sturdy composite steel & fiberglass material. The two-ply woven net is strong enough to be used for all range of shots (full driver to wedge). Unlike some other nets, the SKLZ Quickster Golf Net is EXTREMELY simple to assemble/take-down, and packs away nicely into the included carry bag so you can bring it anywhere you go, or simply store it away. One downside of the Quickster Golf Net is that it does not have an automatic ball return feature. So, just make sure you have a bucket of balls beside you when practicing. What is the Best Golf Mat? The Best Practice Golf Balls What’s the Best Golf Swing Trainer? What is the Best Indoor Putting Green? ‹ What are the Best Putting Aids? Thanks for the reviews! I ended up going with the Net Return Pro Series net and it is awesome. I like that it returns the golf balls so that there’s no chasing or gathering them up, I just keep on hitting. What sold me on it was the 1 year warranty and 250,000 shot warranty. I’ve had it for a couple of years now and it’s still not showing any signs of wear or tear. I’ve hit some balls into with my driver that I thought for sure would go right through. I got mine through shopindoorgolf.com at the same price, $595. Where ever you get it I definitely think it’s well worth the cost. 2 Pings/Trackbacks for "What is the Best Golf Practice Net?"